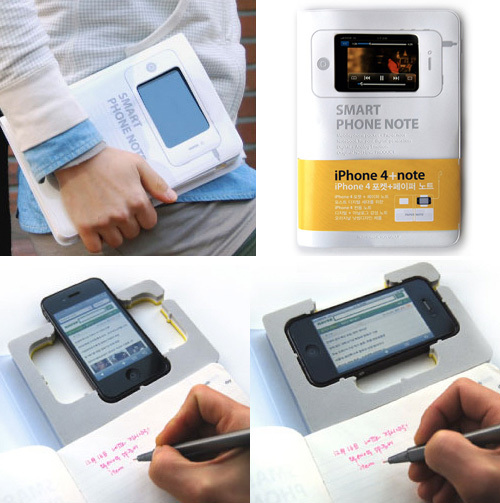 Smart Phone Note – iPhone 4 Case + Notebook In One | OhGizmo! While not necessarily designed exclusively for students, I’m filing this notebook/iPhone 4 case under ‘back to school’ gear since I think I would have found it really handy back when I still had classes to attend. The top half of the notebook features a foam mould designed to hold the iPhone 4 in landscape or portrait orientations, while a strategic cutout lets you still access the headphone port when it’s turned sideways. On the inside of the cover you’ll find slots for holding debit or credit cards, as well as business cards. And since the notebook will set you back about $29 (30,000 WON) from design tag, the notebook portion is fortunately replaceable once you fill it up.